With its origins stretching as far back as 1955, the smoothbore design is the original and some would say still the best. Most commonly found in applications of high exertion, you can find these on motorbikes as well as more industrial sectors including those with high heat where the possibility of spillage can hold health and safety implications. This type of hose consists of an unconvoluted, straight PTFE tube with an outer braid, usually stainless steel wire. Design Options: Natural or anti-static PTFE hose liner, standard wall or thick wall. Single or double stainless steel wire braid, PVC, Nylon or Sarlink plastic covered and many more available options to choose from. Very similar to a smoothbore but it has far more flexible properties which are a great asset when trying to resist kinking. It is sturdy against most pressures, making a convoluted PTFE hose ideal for us in heavy duty environments. However problems are created by the inner convolutions which can often entrap material and generate ‘turbulent flow’ in the fluid passing through, leading to reduced flow rates. Design Options: Natural or anti-static PTFE, stainless steel wire braid, polymer braid or PVC, Nylon, Hytrel or Sarlink plastic covered. 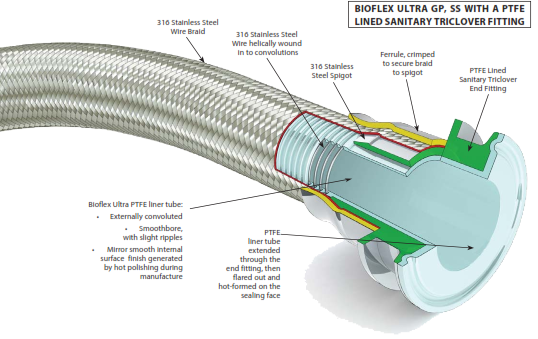 Patented in 1998, the Bioflex hose is a major landmark in the evolution of the PTFE hose. Its design allows for easier cleaning which is something that predecessors struggled to attain. Since the 90’s it has gone on to set the standard for all high purity process fluids around the world. In comparison to the smoothbore variation the Bioflex hose has greater flexibility, and also has no toxic adhesives which eliminates the possibilities of process fluid contamination. On the other hand, in comparison to the Convoluted Hose this has better cleaning ability due to no internal convolutions, has double the flow rate, is self draining and has no whistling noises with gases.